Jane Austen is famously quoted as saying of Emma ‘I am going to take a heroine whom no one but myself will much like’. And it appears that prediction holds true in 2018, at least for the book-clubbers of Leiden Magazine. With the exception of this reviewer that is. My fellow bibliophiles, all of them twenty-somethings, wrinkled their collective noses in distaste of Emma Woodhouse’s character, citing words like immature (Emma is not yet one and twenty); mean, selfish and snobbish. Myself, of a worldlier age and having fallen for Emma in my mid-30s, find her witty, charming, interesting and capable of great introspection and honest reflection as she struggles to realise her better self. The titular heroine is described by Austen in the opening line of the novel ‘Emma Woodhouse, handsome, clever and rich with a comfortable home and happy disposition, seemed to unite some of the best blessings of existence; and had lived nearly twenty-one years in the world with very little to distress or vex her’. Emma is the only one of Jane Austen’s heroines to ‘have it all’. By contrast, other Austen heroines battle financial woes and awkward family situations that have us cheering for the underdog. Emma is Austen’s only Tall Poppy. Like all romantic comedies, the story is simple. There is a girl, there is a boy, there is a call to love, high jinks, confusion, red herrings and an inevitable happy ending. And while Emma is certainly not short on romance, the emphasis is firmly on comedy. The novel is chocked full of comical characters, witty one-liners, and farcical situations. Yet while I find the prose rolls along swiftly and rhythmically, other book-club members found it difficult to engage with, slow and laborious. It pains me to report this Gentle Reader, but I am bound to share the opinions of the other book-club members, however wrong they may be. ‘Clueless’, on the other hand, suffered no such fate from our culture club. We were unanimous in our love for the 1995 Hollywood Teen Rom-Com loosely, albeit unmistakably, based on Emma. So beloved is this movie, that our members were each able to quote lines verbatim. 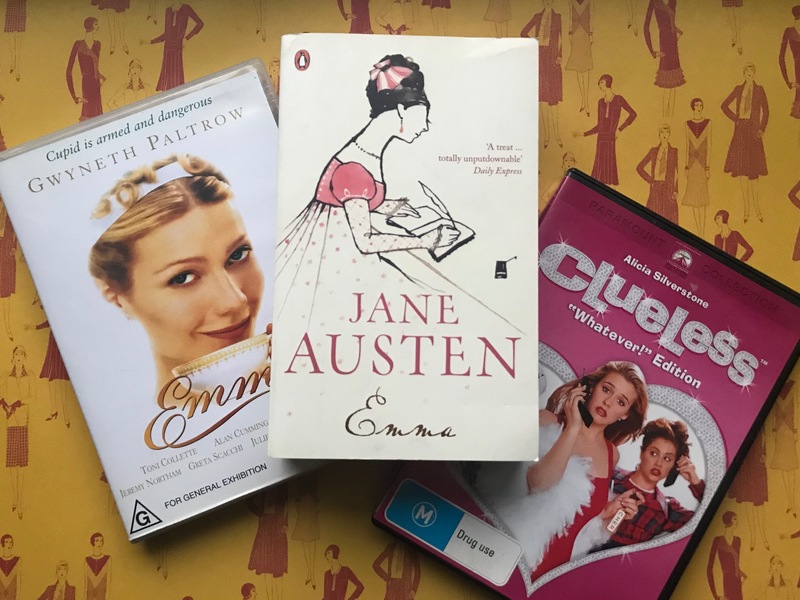 Alicia Silverstone’s ‘Emma’, a.k.a ‘Cher’, was forgiven, nay, indulged, by our audience, for her vain, vacuous, idle, self-centered existence; due in no small part to Writer/Director Amy Heckerling’s keen translation of Austen’s comic genius. Also, I just really wanted to write a long sentence full of commas and semi-colons; like my hero Jane Austen. And speaking of Heroes! Gwyneth Paltrow, You are forgiven for GOOP — much like Alicia Silverstone is forgiven her Emma but not her anti-vaccine stance — for bringing to life, the quintessential Emma in the 1996 Film of the same title by Writer/Director Douglas McGrath. This wonderful period piece is an almost flawless representation of the novel. But sadly there is a flaw. And that is in the mis-casting of Toni Collette as the sweet, ingénue, Harriet. In exaggerating the coarseness for maximum derision, it lost the finer nuance of Austen’s beautifully drawn character. And that is something which I cannot forgive. There is pause here to segue to how Ang Lee’s ‘Sense & Sensibility’ was similarly rendered imperfect by a small sleight . . . but I digress. And so in summary, Fair Reader, Leiden Book Club unanimously endorse ‘Clueless’, (the driving lesson on the freeway is a stand-out scene); heartily applaud ‘Emma’ (the Gwyneth Paltrow version), notwithstanding the clunky interpretation of Harriet; and half-heartedly commend the Jane Austen novel from which this whole conversation sprung. Susanne is an avid member and occasional moderator of the Leiden Book Club. She has a love of classic literature and hopes to one day attend a book club meeting where everybody who turns up, has read the book.